“The Wife” begins in 1992 with a phone call that wakes up Joe and Joan Castleman. When Joe answers, he hears the caller from the Nobel committee in Sweden telling him he’s just won the award for Literature. Thrilled, Joe immediately tells Joan to pick up the extension (remember when you had one of those?) so she can listen in as the Nobel representative congratulates Joe and raves about how Joe’s writing has changed the very nature of the modern novel. As Joan listens, her facial expression changes from excitement and pride to bewilderment to a look that says there’s more underlying her feelings – but we don’t know what. 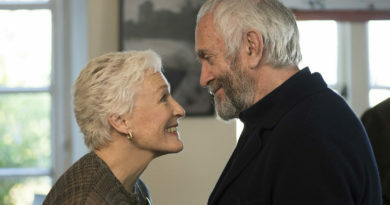 The actress who presents all those different emotions is the formidable Glenn Close who, at 71, has been given her best role in a very long time. Her performance is simultaneously powerful and subtle, a seemingly impossible combination, yet she pulls it off brilliantly. Joe is played by Jonathan Pryce with an arrogance and exuberance I’ve never seen from him. It’s obvious Joe has a secret, too, but it’s not about the numerous times he’s been unfaithful because Joan already knows. As the Castlemans and their son David (Max Irons) travel to Stockholm to receive the Nobel Prize, Nathaniel Bone (Christian Slater) questions them about their past in preparation to write a biography about Joe, revealing some of the pieces of the family puzzle. In flashbacks we see Joan as a Smith College student and Joe as her married professor, smitten by her looks and creative talent. Young Joan is played by Annie Starke, who looks remarkably like Close because she’s her real-life daughter and has inherited some of mom’s acting talent. Young Joe is played by Harry Lloyd. Obviously, Joe leaves his wife and marries Joan, who leaves school and devotes herself to a new life as – her description – “a king maker”. It would be a disservice to divulge more, but suffice to say that the release of “The Wife” is in sync with the #MeToo and #TimesUp movements, as well as the lingering sting of the 2016 presidential election. But even if none of that were true, “The Wife” would still be worth your time and money just to watch Close work. She’s never won an Oscar, but she was up for Best Supporting Actress for her first three movies — “The World According To Garp” (1982), “The Big Chill” (1983), and “The Natural” (1984) — before moving up to leading roles and nominations for Best Actress for “Fatal Attraction” (1987) and “Dangerous Liaisons” (1988). Then she ran into a two-decade nomination drought broken in 2011 when she got a nod for “Albert Nobbs.” Along the way, she had a hit TV series (“Damages”), did voice and live-action work for Disney and, oh yeah, also won a couple of Emmys and three Tonys. When she gets the inevitable call that she’s been nominated again for an Academy Award for “The Wife,” I wonder if she’ll wake up Jonathan Pryce to listen in on the extension. Thanks to Close, her supporting cast, and some skillful direction by Swedish filmmaker Bjorn Runge (who never lets his camera get in the way of the drama), I give “The Wife” a 9 out of 10. It will be on my Best Of 2018 list.